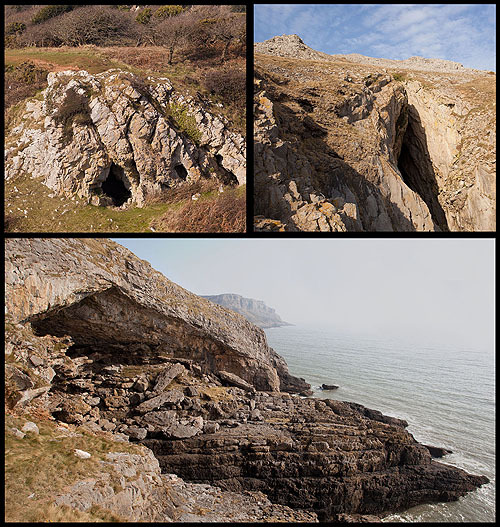 Top right - Minchin (Mitchin) Hole Cave (SS 5552.8685), at the bottom of the cliff below a prominent knoll - High Tor , the largest of the Gower coastal Bone Caves / very difficult to reach. Bottom - Bacon Hole (SS 5601.8683), at the base of the cliffs to the west of Deep Slade bay ,one of Gower's larger and more famous bone caves . Bacon and Mitchin caves were occupied during the Iron Age , Roman and later periods.